The Netball World Cup 2019 has been officially launched in Liverpool! The launch event took place at the city’s iconic St George’s Hall, ahead of the first Regional Qualifier tournament. Today’s event featured an exhibition game of netball in the historic Great Hall, with women and girls representing a variety of netball-playing nations joining speakers from Netball World Cup 2019, England Netball and Liverpool City Council. The main strategic ‘pillars’ of the event were also revealed through the launch of the event brand. The brand, entitled ‘This is Netball’, will incorporate four pillars: elite sport, empowering women and girls, Liverpool and the world. More information about the story behind the Netball World Cup 2019 brand can be found here. Speaking about the elite aspect of the event, which will see 16 of the world’s leading teams come together to compete over a thrilling ten-day period next summer, former England international and Director of Netball at Vitality Superleague champions Wasps Netball, Tamsin Greenway, said: “The Netball World Cup is the pinnacle competition in netball and will bring the very best players in the world to Liverpool in 2019. Speaking about how the Netball World Cup will inspire and empower women and girls, England Netball CEO Joanna Adams said: “Through Netball World Cup 2019 we have the opportunity to empower women and girls to be the best they can be. “Seeing incredible athletes and fantastic female role models competing at the highest level, on their doorstep, will inspire women and girls across the country to get involved in our unique sport. Speaking about the home that Liverpool will provide for the event, Wendy Simon, Assistant Mayor and Cabinet Member – Culture, Tourism and Events for Liverpool City Council, said: “Staging prestigious events such as the Netball World Cup is yet another reason why Liverpool is held in high esteem in the sporting world. “Netball is a hugely popular sport, and I’m sure when the World Cup heads to the Echo Arena Liverpool it will live up to its reputation as a fast-paced, boisterous and hugely entertaining sport. Speaking about the global reach of the Netball World Cup 2019, Event Director, Lindsay Impett said: “Netball World Cup 2019 will be a truly international tournament and we aim to capture the hearts and minds of people across the globe to raise the profile of netball worldwide. 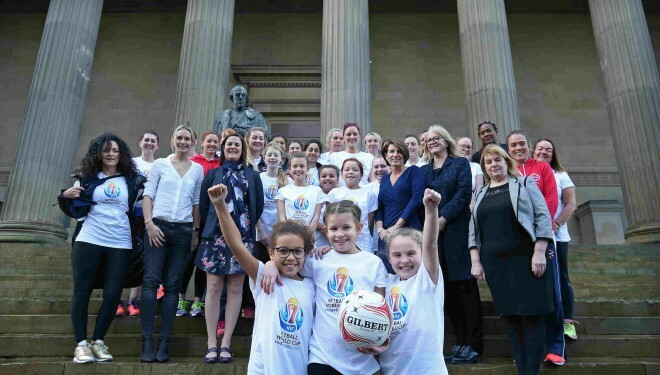 “Welcoming the world to Liverpool in 2019 is an important part of our event, but so too is supporting the International Netball Federation with the worldwide development of netball. “The Netball World Cup is the INF’s most prestigious event and we are delighted with the progress made so far. “The event is totally aligned with our three core strategies of Thrilling World-Class Events, Empowering Through Netball and Governing With Integrity, and all the values we hold dear for the development and success of netball around the world. “It’s wonderful to see players from all our five regions represented here today.